Pivot3 has a new vSTAC product combining its hyper-converged infrastructure appliance tech with NexGen Storage’s all-flash array technology and quality of service functions. NexGen was acquired by Pivot3 in a cash-free merger in January. 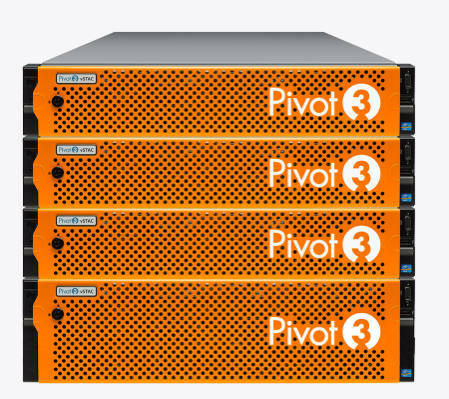 At that point, startup Pivot3 was shipping a range of vSTAC hyper-converged appliances. After the merger it took in a $54.6m funding round and the updated vSTAC is one of the first fruits of that. The product combines a multi-tier flash array, with a QoS engine, and a hyper-converged appliance, and is managed using a vCenter plug-in. Storage is provisioned at a VM-level and the product has high-availability. Storage for the VM’s hosted on the HCI cluster can be provisioned on either the storage in the HCI cluster or on the all-flash array via the vCenter plug-in. For example, a customer could provision VM’s that need the sub-millisecond latency of the all-flash array on the flash array tier or VMs that would benefit from being assigned service levels and performance policies using QoS. Other VMS could be provisioned with HCI storage. Datapath enhancements facilitate efficient, high performance data transfer between HCI cluster and flash array tier. There are three base configurations; vSTAC SLX 50, SLX 100, and SLX 200. Each consists of 3 (Pivot3) HCI Hybrid Appliances in a cluster and 1 (NexGen) All-Flash Appliance. The NexGen AFAs are now called Pivot3 N5 Flash Arrays by the way. All three configs have 2.6TB of PCIe flash in the N5 flash array. The SLX 200 uses the N5-6000 all-flash array with a 60TB to 240TB capacity range. There are 20 x 10GbitE ports per SLX system. Pivot3 says traditional hyper-converged products lead to over-provisioning for either storage capacity or performance, but its new vSTAC offering doesn’t suffer from that new limitation. Provocative indeed; that's a creative adjective to use.